Hybrid mattresses are trending now in a big way... for good reason. 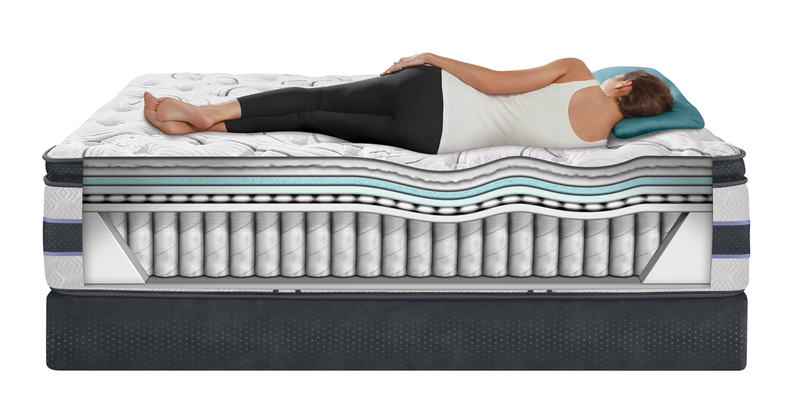 Your typical hybrid mattress will be composed of nearly 50% comfort layers (memory foams, cooling gels, latex, or other comfort foams) on top of its support core (usually independent pocketed coils). In the mattress industry, there has been longstanding debate and controversy over which is genuinely better for supportive alignment while you slumber, the independent pocketed coil mattress or the memory foam mattress. Essentially, the hybrid mattress is both. In the image, you can see the responsive design of a hybrid mattress and its conformity to the contours of the body.